In a recent essay on the state of comics studies, Charles Hatfield notes comics scholars’ tendency to begin their contributions with an “attempt at definition”—that is, an effort to identify comics’ unique formal properties as a means of legitimating them as an object of scholarly (and also private) interest (¶10). He’s not the first to notice the mania for definitions that grips the field. But this strategy begs the question: Attempts to define comics as a medium or form assume we already know what it is we’re trying to describe. That may seem like a pedantic point, but it’s actually a significant theoretical and methodological problem. Any description of the object of study presupposes some knowledge of it, which in turn rests upon our ability to classify examples as belonging (or not) to the relevant corpus. If our commonsense notions are in some ways skewed, biased, or even flat-out wrong, then our formal definitions will suffer, too. Perhaps, rather than trying to define what comics is, we ought to ask some different questions: where is comics? where does the object of comics studies end? and with what kinds of institutions, spaces, and contexts is it involved? For example, Bart Beaty has argued that, after a period of relative autonomy, the North American comics industry has been substantially reintegrated into the larger entertainment economy. Marvel and DC Comics are sources of intellectual property for Hollywood, the games industries, toy manufacturers, and so on. Meanwhile, comic-book series based on currently popular TV shows and nostalgic revivals of older properties have become mainstays of publishers like IDW and Boom Studios. The logic of synergy and convergence implied by this analysis suggests that, if we want to understand what’s happening in the pages of (at least) mainstream American comics, we need to look well beyond them. That is to say, superhero movies, television series, and licensed merchandise are as much a part of the “world” of comics (Becker 1982) as the comics themselves. I want to suggest that we can reach a similar, though distinct, conclusion if we look at the distribution and consumption of comics. To begin teasing open these issues, let me turn to an image of a somewhat unusual kind of image for comics studies. The largest, in the upper right, might be called the space of media fandom. Its most central nodes are a nerdy film society (ORG1) and its president (ORG1-p1), who is personally heavily connected within the local scene, and the local science-fiction convention. In the bottom right is the space of gaming. One of the three comic-bookstores I studied (STR4) also had significant investment in the gaming market, and so it’s located here because of the role-playing, card, and miniatures games it supports. This cluster as a whole overlaps with the first, due to the fact that game store STR1 and gaming club ORG4 were included in the first field, and the number of nodes associated with the games industries that either sponsored or were promoted at ORG1 events I attended. 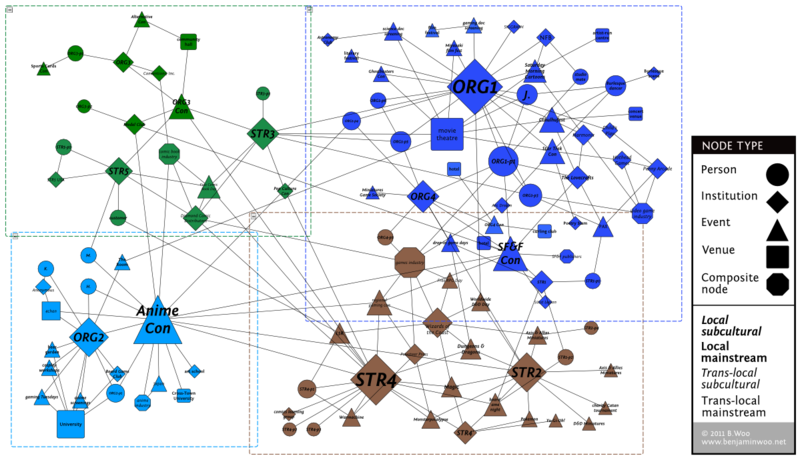 In the bottom left is a cluster related to anime and manga fandom, which has a number of ties with nodes related to gaming and media fandom, but which also contains a parallel set of institutions that are relatively independent of the rest of the scene. The major nodes in this cluster are a university anime and gaming club (ORG2) and an annual anime convention held locally. Finally, in the upper left we find what I would identify as the space of comics. This cluster contains two comic-bookstores (STR3 and STR5), as well as a small, bi-monthly comic convention (ORG3). Connections that I observed directly or that were mentioned to me in interview are presumably only the tip of the iceberg. One could also presumably map the ways that individual participants—as customers of stores and attendees at events—move between these spaces and access trans-local media resources, such as fan websites and creators’ Twitter feeds. Moreover, relationships between these media resources could be analyzed. So, the figure is in one sense woefully incomplete. Nonetheless, I think it helps substantiate the intuition that comics, their audiences, comic-bookstores, and even the comic-book industry as a whole are embedded in a larger social space. Of course, anyone who has ever set foot in a comic-bookstore or a convention—or even just paid attention to the ads in a mainstream comic—already knows this. We know that comics readers and collectors have always shared these spaces with devotees of (more or less) related cultural practices, such as gamers and sci-fi fans. But what does this mean for comics studies as a field of inquiry? First, recognition of this fact suggests something like a Copernican revolution in our approach to questions of aesthetics in comics. One routine feature of the social interactions I’ve observed in the nerd-culture scene is participants endlessly debating the aesthetic quality of the comics they read, the movies they watch, and, well, pretty much everything. I’ve come to think of these discussions as the exercise of “aesthetic reason,” a form of reasoning that is practical and embodied and that people internalize to a greater or lesser degree by participating in the scene. There is no “pure” aesthetic that begins from a transcendent encounter with the object. We always relate to comics from within some cultural context—and, in many cases, that context is not only the space of comics but also the broader and complexly organized field of nerd culture. Second, it highlights the importance of “cultural intermediaries” in the construction of the scene (see, among others, Nixon and du Gay 2002; du Gay and Pryke 2002). These actors—including retailers, group organizers, and well connected fans—are gatekeepers in the scene. By selectively curating from among the available cultural options and educating the tastes of other participants, they shape the configuration of the scene. Moreover, they do much to provide and maintain venues for interaction between participants, enabling precisely the kind of debate and reasoning discussed above, and forging the links between the various communities and niches that compose the nerd-culture scene. In a 2008 essay, I proposed scenes of comics production and consumption as a methodological lens for organizing inquiry into comics and their history. I suppose I am renewing that call here, though with a somewhat more contemporary focus. As my own research on one nerd-culture scene has progressed, I have become more convinced that we have to look beyond our borders. Our object of study is part of an organized social world, and so “understanding comics” also means understanding the social contexts in which they are produced, circulated, consumed, and commented upon. Thus, we must consider a wide range of objects and practices that articulate with the space of comics. At times, these will impinge upon our readings of comics texts, posing difficult questions that may well require research with human subjects or quantitative methods of analysis, but it is to be hoped that they will also open up new vistas for examination. Beaty, Bart. 2010. “The Recession and the American Comic Book Industry: From Inelastic Cultural Good to Economic Integration.” Popular Communication 8(3): 203–207. Also available online at http://bartbeaty.files.wordpress.com/2010/05/popular-communication.pdf. Becker, Howard S. 1982. Art Worlds. Berkeley and Los Angeles: University of California Press. Du Gay, Paul, and Michael Pryke. 2002. “Cultural Economy: An Introduction.” Pp. 1–19 in Cultural Economy: Cultural Analysis and Commercial Life, edited by Paul du Gay and Michael Pryke. London: SAGE. Hatfield, Charles. 2010. “Indiscipline, or, The Condition of Comics Studies.” Transatlantica 2010 (1). Nixon, Sean, and Paul du Gay. 2002. “Who Needs Cultural Intermediaries?” Cultural Studies 16 (4): 495–500. Woo, Benjamin. 2008. “An Age-Old Problem: Problematics of Comic Book Historiography.” International Journal of Comic Art 10 (1): 268–79. Also available online at http://sfu.academia.edu/BenjaminWoo/Papers/123729/An\_Age-Old\_Problem\_Problematics\_of\_Comic\_Book\_Historiography. Benjamin Woo is a doctoral candidate in the School of Communication at Simon Fraser University in Burnaby, Canada. His research examines the community-making practices oriented to media and cultural goods associated with “nerd culture.” His essays on comics have been published in The International Journal of Comic Art, the edited collection The Rise and Reason of Comics and Graphic Literature (J. Goggin and D. Hassler-Forrest, eds., MacFarland, 2010), and The Journal of Graphic Novels and Comics (forthcoming, December 2011). He occasionally blogs on issues related to his research at benjaminwoo.net and posts as @wooesque on Twitter. Pingback: Cartographier “ce qu’est aussi la bande dessinée” | Picturing it!